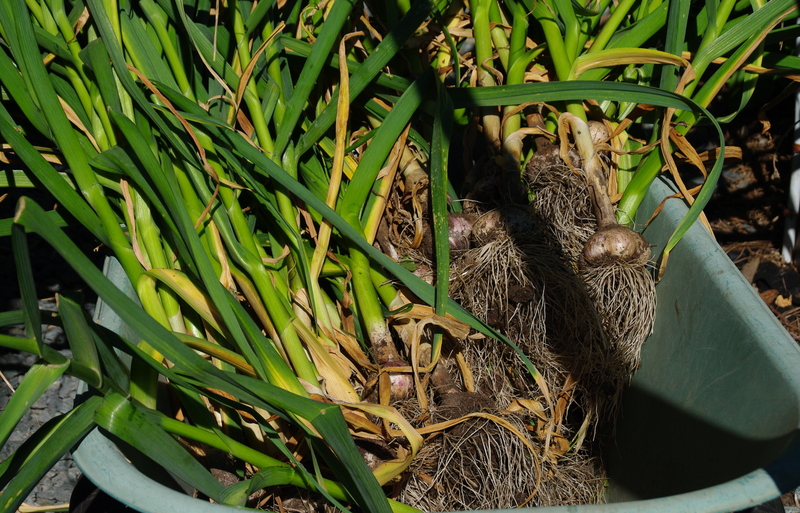 today i dug up the 70 or 80 garlic bulbs after letting them dry out for a week or so. i’ve hung them to cure for another week, or longer, as we have a few showers on the way. the air is definitely redolent with their sweet aroma. on other fronts, the bush beans are ready, peas picked and frozen and my onions are only days away from harvesting. we’ve been busy drying 18 kilo of cherries and will get 9 kilo of blueberries for freezing in 2 days. we’re still picking about a litre or more of raspberries every second day with many days left to go. still to come: carrots, tomatoes, leeks and celery.